At the Movies: Filmmaking Magic — A.B.L.E. 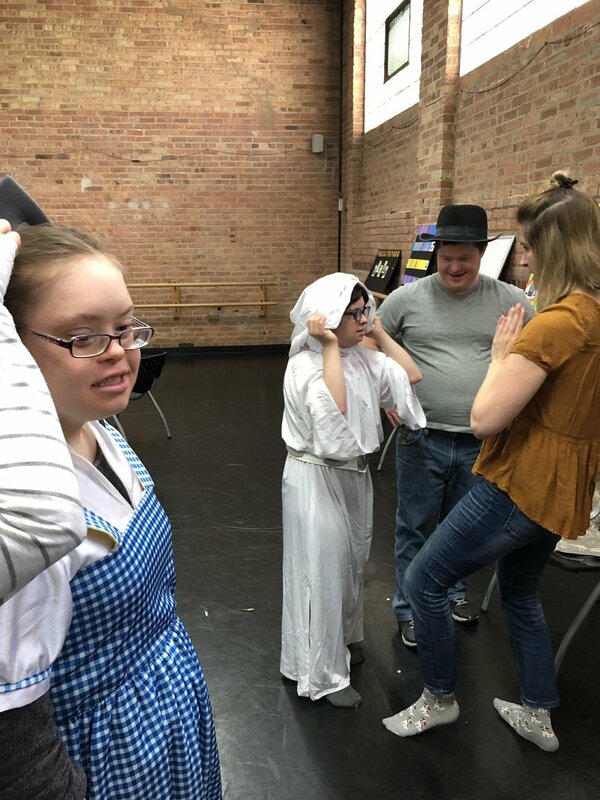 Our adult ensembles have been hard at work devising an original show like none other. We’ve been learning more about the movies and even making some of our own. Find out more on today’s blog! Genres are the different types or styles of movies - and wow are there a lot of them! We checked in about our favorites, and then spent the rest of rehearsals exploring these different genres. In Here to There, we practiced walking through the space as if we were in a Comedies, Dramas, Musicals, and Adventure Films. ACTOR A: Where are you going? But we †ried to put these in different genres. How would you say these lines if you were in a horror movie? A sci-fi movie? A romance? We spent some time focused on musicals as we learned choreography for the big group dance that will finish the show. Let’s just say we made Kevin Bacon proud! One of our favorite parts of class was called Movies in a Minute. Last week our actors shared their favorite movies during check in. This week, we brought in one page synopses of each of these movies and worked as a group to act them out. We made our own versions of The Princess Bride, The Sound of Music, Space Jam, Cats, Hairspray, The Wizard of Oz, Harry Potter and the Chamber of Secrets, and The Empire Strikes Back! We had a busy day with our adult ensembles today, including staging 1-minute versions of some of our favorite movies! Here’s a snippet from our #empirestrikesback but we also did #soundofmusic, #princessbride, and even #cats! This week we took turns infront of the camera to learn more about the different skills needed to work in film. We channeled some of our favorite movie actors during check-in and then got to work. Elephant/Alligator is an old favorite ensemble game, but we switched the rules a bit and made it Closeup/Wide Shot. The idea is the same. One person stands in the center of the circle and points to someone on the outside and says either “close up” or “wide shot.” It’s up to the people on either side had to frame the shot correctly. For a “close up” they would frame the person’s face, for a wide shot, they were part of the picture and all three people would make a pose together. In Extreme Closeup, the camera sees just your eyes and nose. We worked on showing different emotions uses just our faces. This was hard work because, onstage, we’re free to move a lot more freely and encouraged to use our whole body. It was challenging to stay still and communicate with just our faces. Next, we brought back our Open Scenes from the week before, but worked on the idea that sometimes on film, your scene partner doesn’t stay with you. For this game, we had to run in, hit our mark, listen for our cue, and say our line to our scene partner who was off camera! 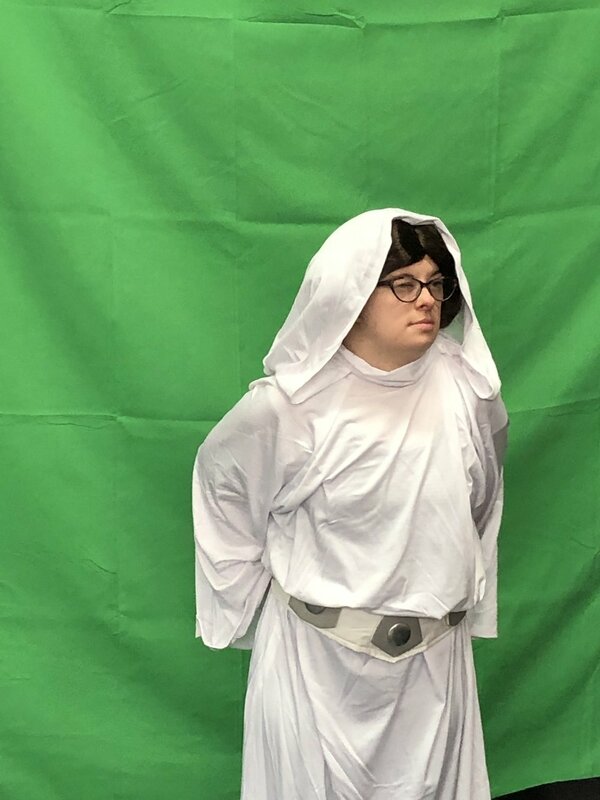 The rest of the session, we got into costume and performed some of our favorite movie lines infront of the green screen. We’ll work some movie magic and incorporate these into our big show on May 14th. After each exercise, we watched the recordings of ourselves. Actors had a blast seeing themselves on the TV monitor, and gave some great, supportive feedback to each other. We’re excited to see our show taking shape, and already have some great monologues based on our actors’ questionnaires and in-class work. Next up: scenes from our favorite movies! Stay tuned!